Like Trump, Does Bernie Still Think NATO Is A Waste of Money? During the Trump administration, we have seen the ramifications of a US that has become more isolationist at home. Russia has become increasingly aggressive and willing to interfere abroad. Democracies increasingly cannot rely on the US, as Trump questions the value of alliances. However, would Bernie Sanders be any different? Afterall, Bernie has dismissed NATO as a "waste" of money for the U.S., which funds a disproportionate share of the alliance among its 28 member nations. During his debates with Hillary Clinton, Bernie was Trump like in demanding that "The countries of Europe should pick up more of the burden for their defense." Finally, Bernie even suggested that NATO was obsolete as Trump has done by proposing that NATO admit Russia and be transformed into anti-terrorist organization, rather than a bulwark against Russian aggression. This pro-Russian stance is particularly concerning given Bernie's long standing opposition to Russian sanctions such as the Magnitsky Act, the 2015 reauthorization of the Act, 2017 Election sanctions, and the efforts to lift sanctions earlier this year. Put another way, if we oppose Trump's Russia friendly policies, why would we support Bernie Sanders and not a Democrat? Sen. Bernie Sanders (I-Vt.) called for a new accord between America, its closest allies and Russia as well as Arab nations as a major plank on how to destroy the Islamic State in Iraq and Syria (ISIS). “We must create an organization like NATO to confront the security threats of the 21st century — an organization that emphasizes cooperation and collaboration to defeat the rise of violent extremism and importantly to address the root causes underlying these brutal acts,” the Democratic presidential candidate said Thursday during a speech at Georgetown University in Washington, D.C.
NATO, the North Atlantic Treaty Organization, started at the doorstep of the Cold War and eventually became a major alliance against the then-Soviet Union. So accepting Russia into NATO, or creating a new defense group all together, would rearrange one of the world’s most powerful bonds by uniting the former rival countries around ISIS as the modern enemy. by Bernie. TIA. I think I'll be waiting a while. I am going to explain how Bernie's dog whistle attacks on foreign countries parallel if not exceed the xenophobic attacks of Donald Trump. Even more so than Trump, Bernie has made a career of blaming America's problems on trade and immigration. In particular, the villain in Bernie's attacks has been Mexico and China regardless of the facts behind his attacks. Indeed, more so than Trump, Bernie has seen fit to mostly exempt white countries from his demands for demands even when Mexico or China account for a small portion of US imports for the product at issue. Along with NAFTA, Sanders said he also would rewrite CAFTA, permanent normal trade relations with China, and the Korean Free Trade Agreement. He didn’t specify what changes he would make but said U.S. workers shouldn't be forced to compete against people making “pennies an hour.” He also criticized deals that lead corporations to move to countries such as China where there are “virtually no environmental standards” compared to the U.S.
“That is not fair competition,” he said. Now who is the biggest importer of steel to the US? China, right? Nope. Mexico? Wrong again. It is Canada, which imports more steel into the US than China and Mexico combined. Indeed, China only accounts for 2.9 percent of US steel imports. I strongly support imposing stiff penalties on countries like China, Russia, South Korea and Vietnam to prevent them from illegally dumping steel and aluminum into the U.S. and throughout the world. American steel and aluminum workers need our help, and they need it now, but not at the expense of farmers, workers, small businesses and consumers in Vermont and throughout this country. Given Vermont’s proximity to Canada and our strong trade relations with Canada, these policies will be especially harmful to Vermont and other northern border states. It simply makes no sense to start a trade war with Canada, the European Union and others who are engaged in fair trade, are not cheating and where workers are paid a living wage with good benefits. So, with the exception of Russia, Bernie supported Trump's imposition of tariffs on non-white countries, but suddenly exempted Canada (the top importer of steel to the US) from steel tariffs? Put another way, we think Trump is racist, but Bernie is the one who wants to focus on non-white countries when it comes to tariffs. Of course, some folks will try to explain that Bernie is only focusing on third world countries with low wages that exploit their workers. Okay. Well, then why is Bernie Sanders including South Korea? South Korea third world? Heck, South Korea has a higher cost of living than the U.S.
President Donald Trump is finding an unlikely ally in his efforts to overhaul the North American Free Trade Agreement: the political left. Civil-society groups, union leaders and left-wing politicians have opposed almost everything Trump has done. But they’re urging him to stand firm in his attempt to overhaul Nafta -- and face down opposition from business groups, who complain that U.S. companies will be hurt by the proposed changes. Mexico and Canada have called U.S. demands unworkable, including on regional-content requirements for cars and investor-state dispute systems. Of course, when Trump threatened to actually do this, as Bernie advocated, Bernie once again stayed silent. Will Bernie flip flop again like he did on steel and condemn Trump if he does indeed withdraw from NAFTA? Or, will Bernie just say that he would do it better? Trump has been trying to justify his attacks on intelligence agencies with the idea that Dubya and Cheney were mislead into launching a war on Iraq. Of course, for folks who remember, a lot of the controversy behind the war was related to how Cheney was heavily pressuring Intelligence agencies to support the idea that Iraq had access to WMD. Remember Valeria Plane and Scooter Libby? Other agency officials said they were not influenced by the visits from the vice president's office, and some said they welcomed them. But the disclosure of Cheney's unusual hands-on role comes on the heels of mounting concern from intelligence officials and members of Congress that the administration may have exaggerated intelligence it received about Iraq to build a case for war. While visits to CIA headquarters by a vice president are not unprecedented, they are unusual, according to intelligence officials. The exact number of trips by Cheney to the CIA could not be learned, but one agency official described them as "multiple." They were taken in addition to Cheney's regular attendance at President Bush's morning intelligence briefings and the special briefings the vice president receives when he is at an undisclosed location for security reasons. Why is it that even in the era of Trump where he attacks Democrats for engaging in identity politics by speaking up for women and minorities even as he panders to white resentment do some “progressive” politicians repeat this theme and attack such efforts? Stacy Abrams has written a brilliant essay explaining why this is a false choice. Stacey Abrams, the rising Democratic star and former Georgia gubernatorial candidate, is giving the Democratic response to plTrump’s State of the Union on Tuesday. On Friday morning, she published an essay with a spirited defense of one of the most controversial ideas in American public life: identity politics. The piece, published by the journal Foreign Affairs, is a response to an essay by famed intellectual Francis Fukuyama. In a recent book, Fukuyama lambasted left-wing movements for dividing the country by focusing too much on appeals to race and gender; he called instead for Democrats to refocus on class to win back blue-collar Trump voters. It’s a familiar argument, and one Abrams finds decidedly unpersuasive. She argues that identity politics is simply the assertion of historically marginalized groups’ interests and right to participate as equals in society, an inevitable and necessary feature of a society marked by social oppression. The piece marks Abrams as the rare politician willing to mount a full-throated defense of the idea of identity politics; the fact that she does so in a sharp and compelling way helps explain why the Democratic party sees her as a rising star. Have Bernie's views on NATO evolved at all, because on feelthebern.org, Bernie is still listed as being very critical of NATO and its mission and Bernie's statements about NATO being a waste of money have not been removed. We criticize Trump for his repeated attacks on NATO and his extortionate demands saying that if NATO members don't pay their fair share, the U.S. might not honor its obligations, particularly in the event aggression by Russia, but it seems like Bernie still questions the need for NATO. Or, perhaps feeltherbern.org just needs a major update if the views listed therein no longer represent Bernie's views. Sanders' views on NATO are somewhat similar to those recently voiced by Trump, who says NATO is unfair economically to the U.S. "NATO is obsolete," Trump said last month on ABC's "This Week." "And there's nothing wrong with saying it's obsolete. But it is obsolete." Bernie opposes the expansion of NATO because it could lead to further aggression from Russia, which is territorially sensitive about the military alliance’s expansion eastward. Bernie also believes the U.S. foots too much of NATO’s bill. Who are the current members of NATO? NATO member countries include the U.S., Canada, the United Kingdom, France, Germany, Spain, Portugal, Iceland, Italy, Denmark, Norway, Poland, Turkey, Romania, Slovakia, Slovenia, Latvia, Bulgaria, Lithuania, Croatia, Belgium, the Czech Republic, Estonia, Albania, Luxembourg, the Netherlands, Hungary, and Greece. Which countries are interested in joining? Bosnia, Georgia, Montenegro, Macedonia, and Ukraine have all indicated an interest in joining NATO. Ukraine’s potential membership has become a hot-button issue in the past year as its conflict with Russia has raged on. What is Bernie’s opinion on NATO expansion? Why would Bernie want to prevent countries from joining? Bernie sees the eastward expansion of NATO as an unnecessary provocation of Russia — and, as stated in the quote above, he’s not interested in revisiting the Cold War era when Russia and the U.S. were constantly pitted against each other. Even “pro-western” politicians in Russia have been hesitant to support NATO’s expansion to include Latvia, Lithuania, and Estonia, the Baltic states that were part of the former Soviet Union. Russian President Vladimir Putin’s personal envoy even suggested that Finland’s membership in NATO would start “World War III,” while Putin himself referred to Ukraine’s potential membership as a “direct threat” to Russian national security. 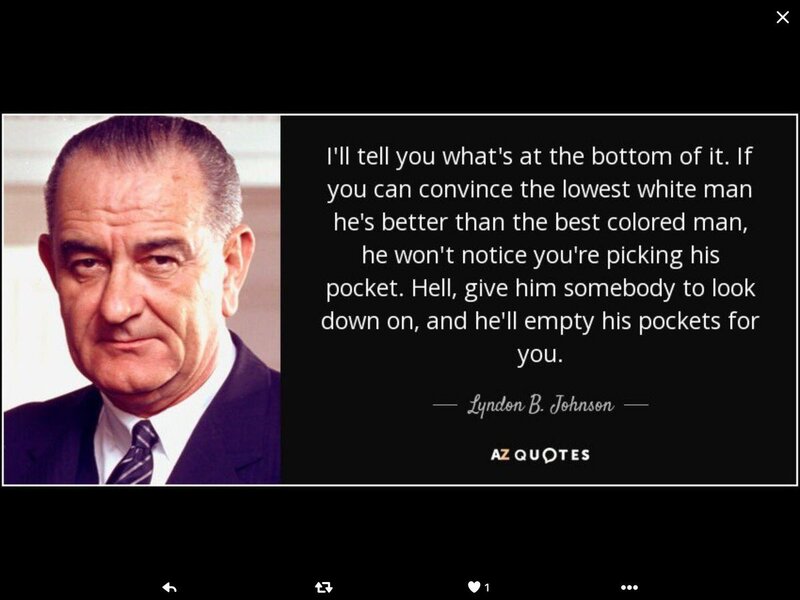 The following Lyndon Johnson quote is often noted as an explanation of how Trump uses the racism of his white supporters as means of oppressing them. Lyndon Johnson, of course, was a white southerner who nonetheless signed the Civil Rights Act. However, there is also Lyndon Johnson's contemporary, Martin Luther King, who addressed this same phenomena from the perspective of a black man. The perspectives of both Lyndon Johnson and Martin Luther King are particularly important during the Trump presidency. We cannot simply deny racial inequality or argue as some progressives have that racism is simply the result of economic hardship. We cannot assume that by eliminating economic inequality, racism will go away. To the contrary, racism itself is used to perpetuate economic inequality. By scapegoating immigrants, racial and religious minorities, and women in the workforce, Trump can get the white working class to sign off on tax cuts to the rich on cuts in salaries to federal workers, to cuts in health care all in exchange for feeling superior and entitled. Part of the problem why the shutdown is going to last so long is because now that Democrats hold the House, the media is falling back into its old pattern of pushing false equivalency instead of objectivity. President Donald Trump on 10 January 2019 claimed he never said Mexico would write a check to pay for his promised new border wall. That’s not exactly true. As a protracted partial shutdown of the federal government was on pace to be the longest in U.S. history, President Trump made the comment as he headed from the White House to Texas, where he visited the U.S.-Mexico border. He was trying make the case that unauthorized immigration was a national crisis that merited an appropriation of $5.7 billion for new border wall construction, an assertion Democratic lawmakers denied. Federal government employees began missing paychecks as of 11 January 2019 due to the impasse over the issue and resulting failure to pass a spending budget. The idea of the wall came from the 2016 campaign trail. Roughly 580 miles of barriers already exist along the nearly 2,000-mile U.S. border with Mexico, and unauthorized crossings are at an historical low. But the idea of Mexico’s paying for the new wall was the subject of a well-known, call-and-response between then-candidate Trump and his rally attendees. Despite President Trump’s more recent comments, he said on many occasions that Mexico would pay for the wall in full. And during a town hall event hosted by Fox News personality Sean Hannity on 13 April 2016, Trump said Mexico could pay by writing a check. Vox - Conservatives won't trade the wall for anything good because they know it's a bad idea. Interesting article that answers the question of why there is no deal to be had: Because it is a stupid idea and Republicans are not going to offer anything worthwhile in exchange for it. Higher taxes on the rich? Nope. Protection for Dreamers? Nope. Thus, despite false equivalency being pushed in the media, Republicans really just want a shutdown and appreciate the cover the media is giving them by pushing a false equivalency. Spending billions of dollars to build hundreds of miles of additional walling — or “steel slats” or whatever you want to call it — on the US-Mexico border is a bad idea. That’s a critical, underrated feature of the current standoff that has led President Trump to partially shut down the government. After all, if the president of the United States wants a $5 billion appropriation for a pet project that’s important to him personally and partially fulfills a campaign promise, then he ought to be able to get it. And the time-honored way to get it is to give congressional skeptics something else in exchange. That’s how the system has worked ever since Alexander Hamilton got James Madison to back federal assumption of state debts in exchange for locating the nation’s capital on the banks of the Potomac River. But back at the beginning of the year, when it seemed as though a compromise involving wall money and a path to citizenship for DREAMers was in the works, it was immigration hardliners in Trump’s own administration who scuttled the deal. That’s certainly their prerogative, but it underscores the core truth of this standoff: Immigration hardliners themselves don’t think the wall is especially useful or important in the real world. If they really wanted a wall, they would go get a wall by offering something — it wouldn’t even necessarily have to be immigration-related — in exchange for it. But since they know the wall is a bad idea, they won’t trade it for anything. Yet precisely because the wall idea is so bad, Democrats, rightly, aren’t going to give it away for free. If you want to get to know about Elizabeth Warren, and get beyond the caricature and stereotypes created by Fox News and Trump, check out the book that put her on the map in the first place. I read it when it first came out in 2004, and it does a great job of explaining why the middle class has become so precarious in the modern age. Fox paints Warren as an out of touch lefty without any real policy chops. The fact of the matter is that she is as serious a policy wonk as anyone running for President. In this revolutionary exposé, Harvard Law School bankruptcy expert Elizabeth Warren and financial consultant Amelia Tyagi show that today's middle-class parents are increasingly trapped by financial meltdowns. Astonishingly, sending mothers to work has made families more vulnerable to financial disaster than ever before. Today's two-income family earns 75% more money than its single-income counterpart of a generation ago, but has 25% less discretionary income to cover living costs. This is "the rare financial book that sidesteps accusations of individual wastefulness to focus on institutional changes," raved the Boston Globe. Warren and Tyagi reveal how the ferocious bidding war for housing and education has silently engulfed America's suburbs, driving up the cost of keeping families in the middle class. The authors show why the usual remedies-child-support enforcement, subsidized daycare, and higher salaries for women-won't solve the problem. But as the Wall Street Journal observed, "The book is brimming with proposed solutions to the nail-biting anxiety that the middle class finds itself in: subsidized day care, school vouchers, new bank regulation, among other measures." From Senator Edward M. Kennedy to Dr. Phil to Bill Moyers, The Two-Income Trap has created a sensation among economists, politicians, and families-all those who care about America's middle-class crisis. I have an electric car and I have had folks in pick-up trucks with a flag flying in the truck bed inexplicably speed up, and try to cut me off out of the blue. There is just a lot of anger being stirred out there. Tesla drivers are reporting a spate of "ICE-ing" (an acronym from Internal Combustion Engine) by large trucks at Superchargers across the country. In one instance, Reddit user Leicina said a group of trucks blocked all of the charging spots while changing "F Tesla" before being asked to leave by an employee of the store. Like most superchargers, the location where the incident occurred — behind a Sheetz convenience store in Hickory, North Carolina, about 40 miles northwest of Charlotte — isn't on land owned by Tesla. Rather, it's leased from third-parties, giving the company no control over how the Supercharger spots are used from day to day. I guess this is just a continuation of the rolling coal "protests."